Rick Sollers (7/11/53 -- 11/27/06) was called home unexpectedly Monday morning. He was an important man in the lives of so many people at New Life Church and beyond. He will be dearly missed. 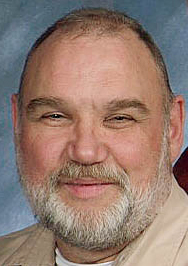 A memorial service is planned for Saturday, Dec. 2, at 3:00 at New Life Church Riverfalls. Please be in prayer for Cindy, Matt, Holly and the rest of their family. I loved Rick. He was truly a man of God. He will be greatly missed. To Cindy, Matt and Holly: I love you and I am praying that God will comfort you and give you peace. Brian is praying, too. I loved Rick. Rick was such a blessing to me every time he said hello and asked me how I was doing. Cindy, Matt & Holly my heart is aching with you. May God grant you peace with each story you hear about Rick. He was such a special person. My prayers are with you and your family. Rick was a good man and I'm sure sad to hear he is not here with us any more. What a delight it must be for such a man of prayer to speak to the Lord finally face to face. I had a great deal of respect for him, and I believe his life brought glory to God. We are struggling to understand that Rick is no longer here. He was such a part of our lives for as long as we can remember. We loved him for his gentleness, his kindness, his faithfulness. What an example of a life committed to Christ! Our prayers are going up hour by hour for his wonderful family. We are asking for peace that passes all understanding. "The arms of Jesus reach out to you in your greatest need. He lifts you to your feet, draws you to His heart, and embraces you with His love. He places His hand under your chin and lifts your head. He looks into your eyes and floods your soul with tender mercies. He will put a new song on your lips, a new direction in your steps, a new purpose in your life, and a new hope in your heart. He wraps you in the warmth of His blanket of grace." I'm so not eloquent with words for this but I pray you find peace knowing that the faith Rick lived outloud in this world is now made sight for him! We sincerely love you and Rick. The prayers of your friends and family will be a shield around you as you simply draw the next breath. What a brother he was to you--to us all! How special the bond between the two of you! Our prayers are lifted to our Father on your behalf and know that you have our love and support to carry you through the times ahead. I pray more earnestly for my lost brothers--oh to have the joy of knowing your brother loves Jesus and is worshiping Him at this very moment! I love Rick as a brother a freind a mentor and as a father figure. Though the work of God he has helped make methe man ofGod the father and huband that I am today. My prayer is that God will choose to use me to influence someone else in the way that Rick has done with me.